A Georgist take on Houston and Harvey. Officials kept telling interviewers that nothing on this level had ever happened, that the flooding caused by Hurricane Harvey was a millennial event. This seems to have been both true and not true — and really, more the latter. Turns out that this is the third 500-year flooding event Houston has seen in the last three years. Something is definitely going on here. It seems likely that climate change is a factor; many commentators noted that the waters of the Gulf of Mexico are alarmingly warm this year. That allowed the storm to quickly build in intensity as it swept toward the Texas coast — and, it allowed it to pick up that much more water when it veered back over the Gulf, and then dump it on Houston. Sprawl development is often seen as a natural process, just the way things are done these days. For example, back in 2005 the Lincoln Institute issued a report on “American Spatial Development and the New Megalopolis” that implied, with apparent approval, that sprawled-out exurban regions are the new normal, delivering a high quality of life and a good deal of convenience. The report made no mention of the environmental consequences of this mode of development. (It also claimed, dubiously, that urban centers had reached the limits of their infrastructures and would be hard-pressed to accept many more people.) As an example of the exurban model, Houston has been thriving. It is arguably the most diverse city in the US, and unemployment is quite low. Aside from flooding, Houston is nowhere nearly as bad off as many US cities. If you aren’t worried about egregious waste of land and resources, and miles and miles of impermeable pavement shunting water off onto lower-lying (and lower-income) neighborhoods, then Houston is doing pretty well. Keep in mind that Houston with ring roads like the 610 can get people in and out (in good weather) quickly from areas that have little apparent land value. That’s where a lot of low income and subsidized housing is built — I’d say most of it. They have little land value because they are intentionally placed in floodplains. The Feds still provide funding to rebuild after floods because that’s where the city wants low income housing. Climate change may well be playing a role, of course, but the city fathers are clear that they do not care to pay for massive infrastructure to handle flooding. If you look at the views of the flooded city, you’ll note that the bayous and streams are where they built most of the road infrastructure. Indeed, the low-lying roadways are where a lot of the water has collected, which makes Mayor Sylvester Turner’s decision not to call for an evacuation seem sensible under the circumstances. Two major reservoirs, called Addicks and Barker, were created in the late 1940s to help control flooding in Houston. They have been in the news lately because they are past full. To guard against this, some water had been allowed to spill out, in a triage maneuver that endangered fewer neighborhoods than it protected. Ultimately, though, both reservoirs began to overflow on their own. While it’s true that Harvey brought a staggering, unprecedented amount of rain to the region, it’s also worth noting that these two dams were initially placed well outside Houston’s built-up region. Today, they are inside the new beltway, surrounded by development. Cars, after all, are how people get around in Texas. Houston does have some public transportation; in fact its systems have recently been upgraded. Two new light rail lines have been built, at the cost of $1.4 billion. City bus routes have been reorganized, switching from a wheel-spoke pattern to a grid, to improve frequency and decrease travel times without increasing cost. Though these improvements have been moderately successful, ridership on the new train lines has been lower than expected. It’s generally known that people don’t use public transportation in Houston unless they have no other way to get places. On an average weekday about 300,000 rides are taken on Houston’s buses and trains. In New York, whose city-limits population is about 3½ times that of Houston, weekday bus-and-train ridership is about 7.6 million. I haven’t been to Houston, so I know nothing of its folkways and nuances. I don’t doubt that there are nice things about the place; one of them seems to be the great courage and fortitude with which Houstonians have pitched in to help their neighbors during the Harvey crisis. One architectural feature of downtown Houston, though, strikes me as, well, kinda creepy. There is a six-mile network of pedestrian tunnels beneath the center-city area. They are built out with shops and restaurants, and are accessible from the basements of prominent office buildings and hotels. They are not a municipal project; as an ad-hoc, private assemblage, they seem not to be very well coordinated or mapped. Perhaps knowledgeable folk can write and tell us why they exist. I could be wrong, but I suspect that they serve as a refuge from the street-level welter of cars, huge belching pickup trucks, parking lots, gas stations, multi-lane streets, service roads and U-turn lanes full of cars, cars, cars. Center-city Houston. Minute Maid Stadium is where the Astros play these days. 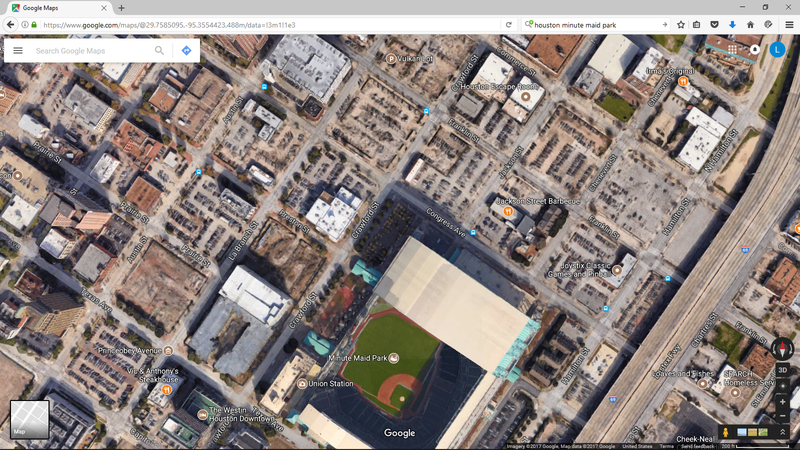 The building just to the right of the search bar is an 8-story parking garage. Another one would free up seven of those surface lots. Metropolitan Houston — the area within I-610, the innermost of the three beltways — may have too many automobiles. But it cannot be said to have too many buildings, or to be unable to absorb more residential construction. There is abundant vacant land, lots of small, obsolete buildings and MANY surface parking lots (which, of course, absorb no floodwater). Some blame this on Houston’s lack of zoning, but that can only be a small part of the story, because Houston’s sprawl is mirrored in many cities that impose stringent regulations. It’s more accurate to say that the “city with no limits” merely epitomizes the exurban model of growth, which seemed so satisfactory for a while — but now shows itself to be not just unsustainable but dangerously unlivable. It might not be an exaggeration to say that in this day and age, the anti-sprawl efficiencies of land value taxation are not just a tool for urban revitalization, but a key to urban survival. Note: The term “500-year flooding event” may be more dramatic than it sounds. It simply means that a given area has a one in 500 chance of experiencing that serious an event in a given year. The Washington Post (8/29/17) reported that there have been 25 such events in the United States since 2010. As of the end of August, 2017, it has been reported that at least 1,200 people have died in catastrophic flooding in Bangladesh, India and Nepal. This article was originally published in the Georgist Journal on August 30, 2017.